Summary BYOD five-bay Atom D525 RAID SATA NAS with dual Gigabit Ethernet and many serving options. It's getting harder to tell the difference among the plethora of models in QNAP's catalog. The latest tweak to its "SMB & Corporate NAS" line is the addition of USB 3.0 ports in its "Pro II" models. 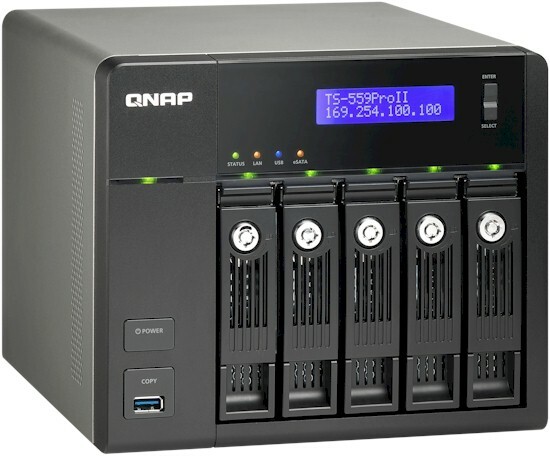 The 559 Pro II looks just like QNAP's other five bay NASes. The only way you know what you've got is to look at the serial # label on the bottom or boot it up and look at the model number in the front panel LCD display. But a glance at the rear panel reveals one of the two USB 3.0 ports. The other is on the front panel, sporting USB 3.0's telltale light blue color. Also in view below are the four USB 2.0 ports, dual Gigabit Ethernet ports supporting aggregation, failover and load balance modes and two eSATA ports. Plug a monitor and USB mouse / keyboard into the handy VGA and USB ports and you'll have direct console access, which you can also get via SSH. I removed the cover to get a peek inside, and ran right into an empty So-DIMM connector that allows you to add 1 or 2 GB more of DDR3 RAM with QNAP's blessings. As is QNAP's custom, the board is mounted component-side in. I tried to get the board out, but couldn't get the drive bay connector completely free without more disassembly than I wanted. By the partial disassembly I was able to do, I was able to spy two Intel WG82574L Gigabit Ethernet Controllers an ITE IT8718F Super I/O, and NEC D720200F1 USB 3.0 controller. I poked around a bit trying various commands to try to determine the D525's companion chip, which of course was covered by a heatsink, but came up empty. The photo below provides a partial view of the board component side. QNAP installed five Samsung Spinpoint F3 HD103SJ 1 TB drives for testing. These produced a 51 W power draw with the drives spun up and 28 W with them spun down. Fan noise was generally low, except for the typical high fan rate at the start of boot time. But an annoying buzz from the enclosure kept me pushing and whacking at the cabinet during testing. The NAS auto-upgraded to 3.4.3 Build 0520T firmware before I started testing. The V3 OS continues to be tweaked and I noticed that ElephantDrive has been added as a cloud backup option in addition to Amazon S3. Here's the latest list of QPKG add-ons available. The Auto Router Configuration uses the same UPnP mechanism. So if the wizard fails, then this will too. For a run-through of V3's other features, see the review or the online demo. As noted above, I tested with 3.4.3 Build 0520T firmware using our standard NAS test process to run tests with RAID 0 and 5 volumes using all five drives. Since RAID 10 requires an even number of drives, those tests were configured using only four drives. The Benchmark summary below shows Windows File copy write with a RAID 0 array measured 100 MB/s, 96 MB/s for RAID 5 and 99 MB/s for RAID 10. File copy read for RAID 0 was slightly higher at 102 MB/s and RAID 5 at 99 MB/s, but much lower for RAID 10 at 71 MB/s. Remember the published results are the average of three test runs, so the log RAID 10 results are not an anomaly. NASPT File Copy write benchmarks were all significantly higher for RAID 0, 5 and 10 at 127 MB/s, 120 MB/s and 125 MB/s respectively. NASPT File Copy reads came in lower in all cases at 82 MB/s, 80 MB/s and 64 MB/s for RAID 0, 5 and 10, respectively. As usual, the tougher NASPT Directory Copy tests couldn't break out of the mid teens. I ran three sets of attached backup tests using I ran backup tests using a Buffalo DriveStation Axis USB 3.0 drive for the USB 2 and USB 3 tests and our standard Iomega Ultramax Pro for the eSATA tests. I clocked the Axis' write throughput at 81 MB/s for NTFS format and 87 MB/s for FAT. I didn't test USB 2 throughput because the drive is obviously fast enough to keep up with the 25 to 27 MB/s results that I usually see for best-case NAS USB 2 backup. Fastest results of 69 MB/s were with eSATA and FAT format. USB 3 / FAT was a bit slower at 62 MB/s. eSATA and USB 3 backup speeds matched up pretty well using NTFS and EXT3 formats. Rsync network backup speed was a relatively poky 40 MB/s to the NAS testbed running Delta Copy. iSCSI write and read to a 10 GB volume created on a RAID 5 array produced 85 MB/s and 67 MB/s, respectively. This put the 559 Pro II in the race among five drive NASes. But it still could not take the top spot away from Synology's DS1010+. The RAID 5 File Copy Write and Read charts below are filtered to show only five-bay NASes. The only other five bay D525 Atom NAS I've tested is the Thecus N5200XXX. But it didn't hold the top spot in this chart for long. RAID 5 filecopy read is a similar story for five-bay NASes. But the Synology DS1010+ finally relinquished the top spot among 5 bay machines. QNAP packs its NASes with both performance and features. And as the price vs. performance chart below shows, doesn't mind charging top dollar for them. The 559 Pro II currently has a lowest price of $1140, while the older 559 Pro and Pro + are close behind at $1048. It seems like QNAP is making it easy for buyers to justify an extra $100 or so to add a pair of USB 3.0 ports. But if you can do without the ports and get a deal on a D510 based 559 Pro or D525 based Pro+, I'd take it. Any way you go, you'll be a five-bay NAS that's among the best you can buy today. Use the new NAS Finder and NAS Charts to compare it with other products.